Egyptians victorious attack on Israeli embassy in Cairo last night leads to a dramatic decision: Israeli Air Force plane returns ambassador, members of diplomatic staff and their families to Israel. And I wonder, how long will it take before Americans, Brits, Germans, Indians, French, Chinese, Argentinians and others do the same. 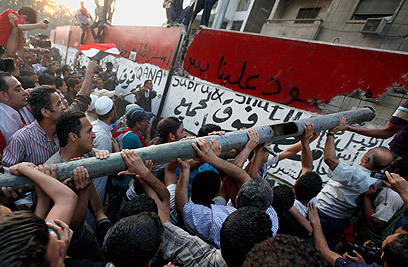 The people of Egypt are proved to be far more responsible and ethical than their political leaders. The citizens of the world should follow. There is no room for racist ethnic cleanser Israel amongst the nations.